Our organizing committee is meeting and registration is now open at Active.com ! 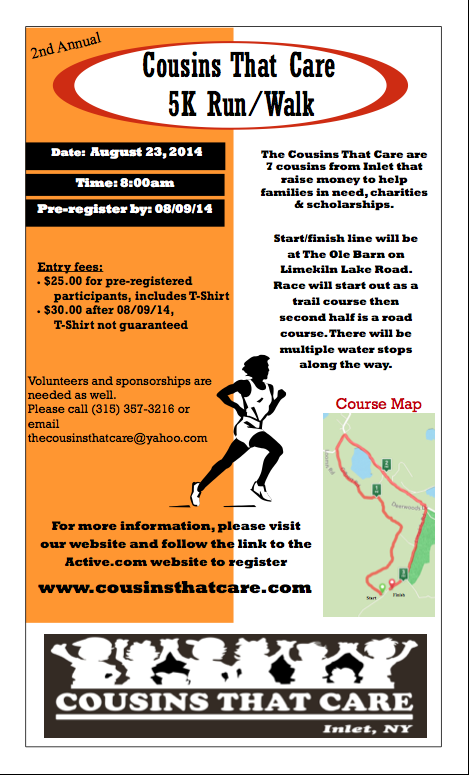 Sign up today to help the Cousins That Care make the 3rd Annual 5K Run/Walk an even bigger success than last year. The event will be held on Saturday August 15, 2015 at The Ole Barn in Inlet, NY. Please contact us today at thecousinsthatcare@yahoo.com or by calling 315-357-3216. Follow the link on the right of this page to sign up to do the run/walk. We look forward to seeing everyone. Thanks for visiting our page. OR you can register in person at The Ole Barn or the Inlet Information Office. We will also accept checks via mail. Please provide your full name, address, email address, phone number, age and shirt size. Checks should be made payable to the Cousins That Care in the amount of $30.00. Please mail them to: The Cousins That Care, PO Box 709, Inlet, NY 13360. You must sign a waiver at time of check-in prior to the start of the run in order to participate. We look forward to a really fun day all for a great cause.